On Friday, October 16th, the Spencer Frye Fellowship Team visited the Athens Area Habitat for Humanity. 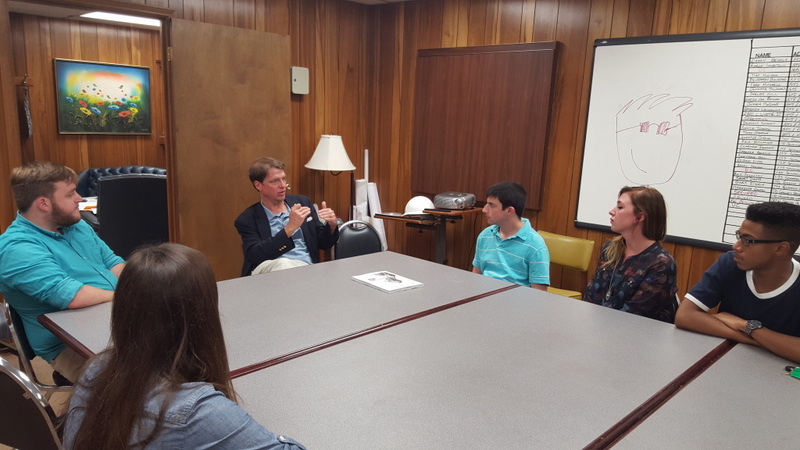 Our visit involved a conversation with Representative Frye on the organization’s operations and their positive impact on the community. This discussion helped us examine the challenges that face Athens and the ways in which those challenges are being addressed. In particular, we talked with Rep. Frye about Habitat’s efforts to combat the poverty that is so prevalent in Athens. Rep. Frye started by explaining how Habitat assists those who are less fortunate. Habitat’s vision is the establishment of “a world where everyone has a decent place to live.” In line with this objective, Habitat helps people work toward home ownership, secure affordable rental rates, and receive home repairs. Although such work may seem simple, we saw the intensive amounts of planning and coordination behind it when our attention was directed to the boards that cover the walls at Habitat headquarters. There was a board for ramps for those with limited mobility, a board for the renters that live in a Habitat-owned building, a board for basic repairs on houses and other residences, and, of course, a board for the homeowners who are going through the process of purchasing homes. This display of such a detailed organizational system helped us realize that Habitat is committed to helping others in an efficient, cost-effective manner. How does Habitat do it? However, “sweat equity” alone isn’t enough to accomplish Habitat’s work. Representative Frye explained that support for Habitat comes through several different avenues. Private donations provide needed capital for Habitat’s projects, and many businesses help bankroll the organization’s efforts. Current and future homeowners also fund Habitat’s work through their mortgage payments, while enterprises like ReStores, which are basically thrift stores operated by Habitat, further contribute to its resources. Finally, Habitat relies upon thousands of volunteer man-hours, with many local individuals and groups freely contributing their time and labor. All of these contributions, both financial and physical, help make Habitat’s efforts a success. While most of us fellows had heard of Habitat for Humanity before our trip to its Athens headquarters, few of us were aware of the complexity and planning that underlie its operations. We were also largely unaware of the tremendous amount of good that this organization does in our community, and we were surprised to learn of the far-reaching consequences of affordable housing. At the end of our visit, many in our group expressed a desire to volunteer with Habitat in the future. It is our hope that as we, and others like us, assist this amazing non-profit, we can help ensure that the Classic City becomes a place where all families can enjoy the security of a safe, affordable place to live.